I have written about how choice, charters, magnets and vouchers are simply a way to hurt and avoid funding public schools many, many times. These “choices” not only hurt public schools they hurt the children that attend them. The takeaway is clear — money matters. You have it and you can get away with shoddy work, no matter the costs to others. If you don’t have it you will be blamed for your individual failings, held accountable. It is this same type of blaming and shaming logic that underpins DeVos’s policy priorities as well — the use of school vouchers and the expansion of unregulated charter schools. DeVos, like the man who chose her for the position of secretary of education, believes students should not be “trapped in failing schools.” She promises to spring the trap by giving them tuition vouchers to attend a school of their choosing. If they fail to choose well, the onus is on them. 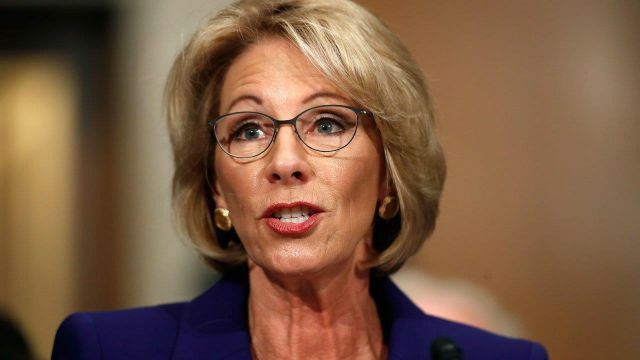 Nevermind that the vouchers will never be enough to cover the tuition costs of elite private schools, or that schools of the sort her children attended may not want low-income students with vouchers. That’s the voucher lie. Vouchers will not cover the cost at elite private schools, so get ready for all new “Voucher Schools” to spring up. These schools will willingly accept vouchers. Voucher money will be there sole reason for being. Voucher money will also be heading to religious schools. How we’ll balance the receiving of public funds with religious dogma escapes me, but using public funds for private business seems all the rage. Here’s the deal with voucher: if you can’t afford private school, then getting a 5,000.00 voucher for a 15,000.00 a year school won’t really help you. And there’s a plan to offer them to everyone. Take a look at Arizona. Senate Bill 1431, which would make all Arizona families eligible for Empowerment Scholarship Accounts. So who will that 5,000.00 benefit? It won’t be poor children. But don’t worry, all those new Voucher Schools will pop up to serve them. And you know they’re coming – just like all those fly-by-night charters that keep springing up. Cash in quick, baby! Meanwhile, people who can already afford private school will be receiving a cool 5 grand. Voucher programs and charter school expansion drain both money and social capital from the traditional public schools, creating even more of an imbalanced, two-tiered system. More insidiously, these policies let politicians and taxpayers, who do not want their tax dollars redirected to the “inner city”, off the hook from having to invest money in upgrading neighborhood schools in low-income communities. These schools can continue to crumble, to poison teachers and students, to find themselves unable to afford the textbooks that are aligned to the state tests, because if the kids remain in these schools, under a voucher system, it’s their own damned fault. I’ve lost count of how many times I’ve written, “School choice allows everyone off the hook for providing basic education.” It’s the escape clause. Not happy with your school? Choice! Want more resources in your school? Choice! Looking for equitable funding? Choice! Any complaint whatsoever with your school? Choice! If you stay, well… it’s your own damned fault! What’s infuriating is how often the word “choice” is tossed around. And pay attention to those tossing it out there. These are people with means. They own cars, have jobs that enable them to drop off and pick up their kids from “choice” schools, make enough money that 5,000.00 would let them attend a 15,000.00 school, etc. These are not people living in remote rural areas with one public school – people who watch their school’s funding decrease due to all this supposed choice. Guess that’s their own damned fault too. Just read that DeVos is confirmed 50/50 with Mike Pence casting the tie breaker. Let the destruction begin as “choice”, vouchers and charter schools reign triumphant. If your a teacher in the public school system expect to be screwed over in coming months as funding dries up to feed the Choice Monster. My meager Smarter Balanced reading comprehension abilities would seem to tell me that in order for Delaware to use vouchers for tuition at a tuition-required parochial school, the Constitution would need to be changed. No? Oh, I’m sure they won’t let that get in their way! Seriously tho… you’d think this would be the end of it, but I doubt it. I’ll have to research Louisiana’s constitution. They have a large voucher program, that, I think, includes religious schools. It’s a good thing that our constitution also forbids casino gambling, otherwise, we’d have table gaming in Delaware. If we were to assume that Betsy DeVos (and Rep. Deb Hudson’s) dream of Delaware Vouchers comes to fruition, clearly the voucher total will leave almost everyone a couple thousand short of meeting the tuition and I’d bet my own salary that those schools will simply stealthily raise their tuition so as to make sure their student population remains exactly who they want it to be. And the voucher will be no where near that 13,500 – that figure includes every type of student, including those with severe disabilities that require one-on-one care. My bet would be in the 5,000 – 6,000 range. And we haven’t even added in the additional fees private schools charge. And… if there is a single string attached to accepting vouchers, the elite schools will pull out (most want nothing to do with vouchers anyway), while our new voucher schools sprout up. In fact, I wouldn’t be surprised if some of our charters go the voucher path and start charging tuition. They’d then be the ultimate private/public-ly funded school! I bet Bill Manning and the Charter School Network are already putting their plan together. They’ll have a proposal in front of the House Education Committee faster than the Trumpkins can write their plan to repeal Obamacare. Manning and the Charter School Network will move faster than the speed of light. The CSN will also become the CVSN (charter/voucher school network).